Once the data has been uploaded and processed, Ravensdown field staff members can log on to the system from a remote location via the Internet. They can call up a customer's farm, see the results of earlier soil tests, see what types of fertilizers have been applied, then make recommendations about which types of fertilizers are appropriate. Technology enables farmers to become more discerning about crop management. Modern precision farming techniques incorporate geospatial technologies to help farmers increase economic yield. Using data from satellites and aircraft, precision farmers can pinpoint problems with drainage, insects, and weeds. They learn where fertilizers are needed and where they are not. Technology has made fertilizer application a precise science. With these methods, farmers have greater control of crop yields before they plant a seed. 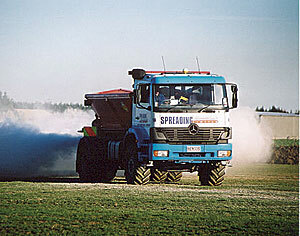 In past generations, farmers tended to spread fertilizer evenly over the entire field. Now spreading methods can be more exact by type, quantity, and location of application. Decking the cockpit of the spray rig with computerized controllers and GPS navigation systems is an approach to farming that is both friendly to the environment and profitable to the farmer. Ravensdown, New Zealand's largest manufacturer and distributor of fertilizers, is using geospatial technology for applying fertilizers that helps New Zealand farmers save money and also protects the environment. By using GIS and GPS to direct application of fertilizers, farmers reduce the amount of potentially harmful runoff of fertilizers into streams and waterways. At the same time, they are reducing their total expenditures on fertilizers by up to 10 percent per annum. Ravensdown worked with Esri's New Zealand distributor Eagle Technology Group to design the solution that is built on ArcGIS Server software. The system accurately records where and how much fertilizer has been applied to a certain area. This information is merged with digital orthophotos and the farm's relational databases to create a vivid picture of the farm's overall soil sustainability. A key concept in New Zealand agriculture is the nutrient budget, which measures all of a farm's nutrient inputs and outputs, including fertilizers, feeds, and farm produce. Ravensdown's new GIS-based system helps farmers optimize their nutrient budget and ensure that their soils receive just the right amount of fertilizers for high crop yield. Ravensdown had already equipped a number of its fertilizer application trucks with GPS-controlled guidance systems and spreaders that captured location, fertilizer type, and spreading data. Ravensdown and Eagle collaborated closely during the implementation process. The system integrated GIS, GPS, wireless transmission, and Internet and intranet technologies, as well as data from various sources. Ravensdown's GIS architecture includes ArcGIS Server, ArcSDE, ArcIMS, and ArcGIS Explorer. Once the raw spatial and attribute data is captured from GPS transceivers on the spreader trucks, it is transmitted wirelessly to Ravensdown's facility where it is loaded into the GIS and processed in near real time. Ravensdown had already equipped a number of its fertilizer application trucks with GPS-controlled guidance systems and spreaders that captured location, fertilizer type, and spreading data. The GIS creates a map-based display that shows fertilizer application data as a series of color-coded "snail trails" that are overlaid on the map, giving a very good representation of the process. An additional benefit is that the system can be used as evidence of "proof of placement" to demonstrate that the fertilizer has been spread in a manner consistent with best environmental practices. Once the data has been uploaded and processed, Ravensdown field staff members can log on to the system from a remote location via the Internet. They can call up a customer's farm, see the results of earlier soil tests, see what types of fertilizers have been applied, and then make recommendations about which types of fertilizers are appropriate. The company's call center representatives have access to the same information and can immediately access this information from its customer relationship management (CRM) system, again in map format. This gives service representatives all the information they need to resolve most phone queries from clients. Maps can be delivered in printed format, e-mailed, or faxed to clients. Eagle used the development capabilities available in ArcGIS Server to embed the map interface in Ravensdown's CRM system. Ravensdown wanted seamless access to the spatial and attribute data, so Eagle Technology developers used the .NET framework to build an interactive map viewer that call center staff can access with a click of the mouse. Staff members can query the database, manipulate the display, and print or fax hard-copy maps. This same model will be used to expand the system to Internet-based users in the future. Ravensdown has had an ongoing program of using geospatial technology to improve services to clients. 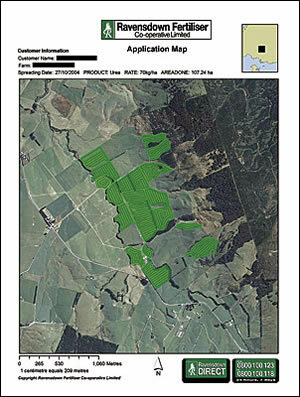 Its Digital Farm Mapping service combines orthophotos from Terralink and agricultural farm management software from AgResearch to support its clients. The fertilizer-spreading application complements this mapping service and gives the company more capabilities to expand in the future. Ravensdown is planning to build on this foundation. "Eventually, we want to enable our clients to log in to an enhanced system from their own Internet browsers," says Mark McAtamney, CIO at Ravensdown. "We also want to incorporate GIS into our quoting system to calculate the road distance between our depots and the fields to be fertilized. The distance is a significant component of the cost to our clients. We are just scratching the surface when it comes to developing further applications for the system." For more information, contact Mark McAtamney, chief information officer, Ravensdown Fertiliser Co-operative Limited (e-mail: mark.mcAtamney@ravensdown.co.nz), or Peng Aik Lim, national GIS account director, Eagle Technology Group (e-mail: Peng_aik_lim@eagle.co.nz).